Boulder is home to 2 distinguished nut companies: Justin’s Nut Butters and Olomomo Nut Company. Both companies offer unique flavors and snack options but in a different way. Justin’s can be found almost all over the country in many different venues. Olomomo is up and coming and is moving fast and furious across Boulder, Colorado and the U.S.
Justin’s produces nut butters in small batches and uses the finest, simple, organic, gluten/dairy free, vegan ingredients. Justin’s has received a lot of publicity for their products; they have been featured in many articles, websites and even on Good Morning America. Justin’s is committed to being a sustainable, low carbon imprint company along with providing quality food product. Justin’s offer nut butter flavors in plain peanut butter, almond butter, chocolate peanut, almond and hazelnut, maple almond, honey peanut and almond. At Whole Foods only, vanilla almond is available, and it’s a must try! The convenient snack packs are great for eating on the go. They are pre-packaged in 2 tbsp servings with around 200 calories, 5-7 gm protein, 2-3 gm fiber. They are great for snacking on hikes, long bike rides or paired with some fruit for a balanced snack. calories for a snack without providing too much else nutritionally. Even if these candy bars are made with organic, natural ingredients, we don’t need another candy bar on the market. I would suggest sticking to the nut butters for a snack. As seen on the above chart, the regular peanut butter has lower saturated fat, sugar and higher protein. Justin Perkins, not to be confused with Justin’s Nut Butters, started Olomomo Nut Company in 2008 after moving back to Boulder from Washington DC. He was inspired by Steve the nut guy in Washington DC farmer’s market. His original idea for starting the company was for his wife to have a creative job while in the process of moving back and getting settled. They sold Olomomo Nuts at 5 farmer’s markets in 2008, and they were a hit selling around 5,000 units. In 2009, they were burnt out as Justin had a full time job on top of producing Olomomo’s nuts plus raising a family. He was seriously considering tossing in the towel for Olomomo, but after he won statewide business plan contest in 2009, he decided to keep going. Olomomo has received local and national attention as well. They were featured on the cooking channel in 2008, recently on Good Morning America and on Channel 7 News. Olomomo is in many coffee shops and specialty grocery shops in the Front Range, and he wants to continue to reach out to more cafes, small groceries nationwide. You can also order straight off the website. 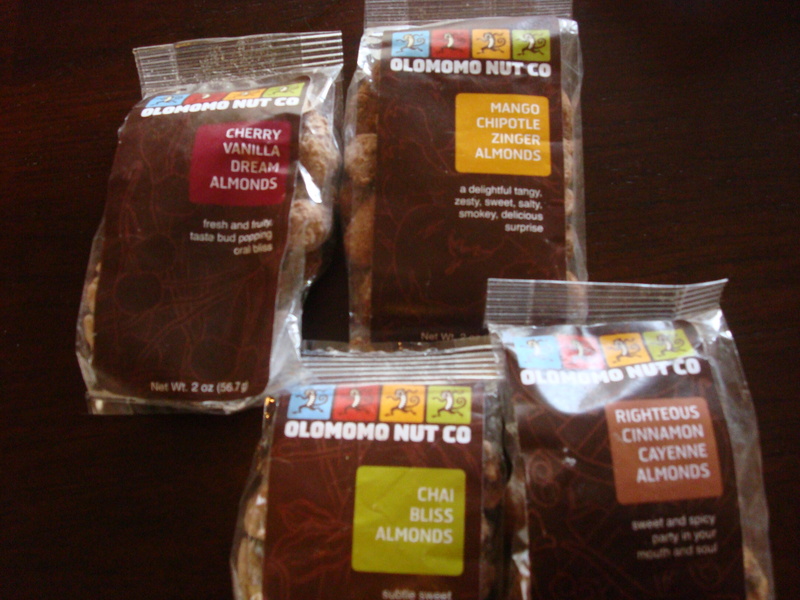 Olomomo has 5 unique flavors: cherry vanilla dream almonds, chai bliss almonds (a personal favorite), righteous cinnamon cayenne almonds, mango chipotle zinger almonds and cosmic maple masala pecans. The flavors pop in your mouth and give pleasant layers of taste without being over the top. Justin’s goal through Olomomo flavors is, “To open the minds of middle America to the rest of the world through food.” Justin has a strong dedication to giving back to sustainable, global organizations and to connect common America to the rest of the world through Olomomo. A serving of Olomomo’s nuts, which is half the size of the snack bag, is 160 calories, 12 gm fat, 8gm of sugar and 5 gm protein. Not bad for a snack, just keep in mind there are 2 servings in each bag. 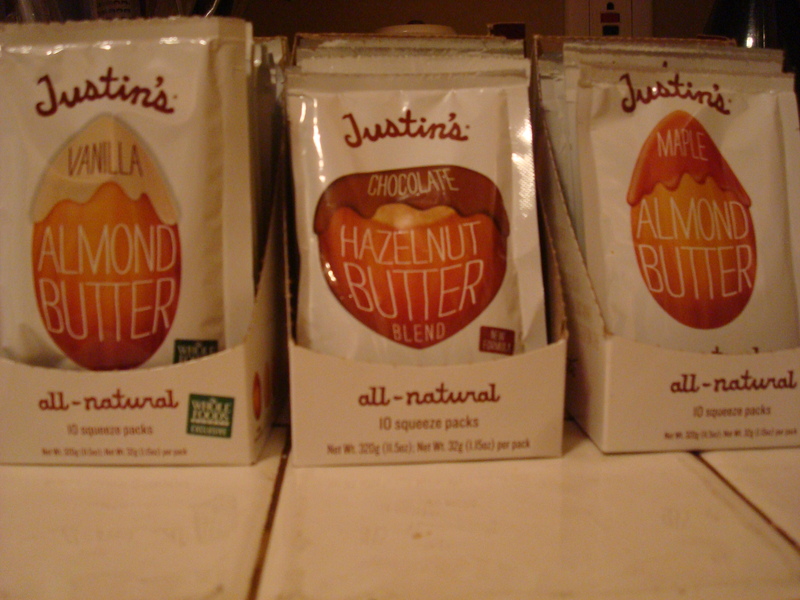 Justin wants to provide healthy snacks for people on the go and a healthier option than energy bars. He uses just enough evaporated cane juice for flavor and for the coating to stick. Look for lower sugar products from Olomomo in the future as well other snack products. Both Boulder nut products offer healthy, flavorful options for snacks. Nuts have been shown in research to potentially help with weight loss, heart health, provide high amount of antioxidants and stabilizing blood sugar. Justin’s nut butters can also be used in many creative recipes found on the website. 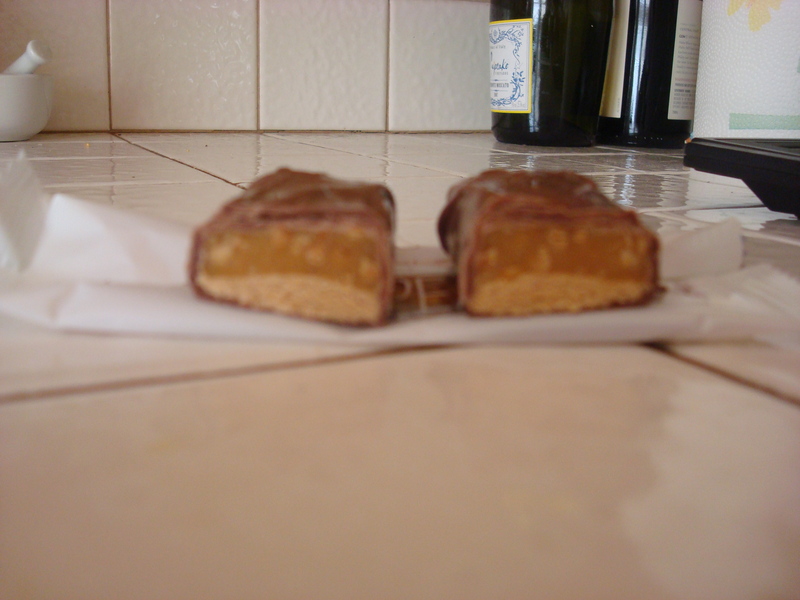 As far as the candy bars, as always, eat sporadically if you must. Previous Previous post: Centro is Turning 5! Next Next post: Join Our Growing Staff!